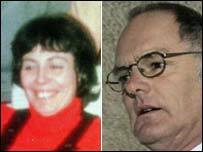 Retired teacher Gordon Park has been found guilty of the murder of his wife nearly 30 years ago. Park, 61, from Barrow, Cumbria, bludgeoned his wife Carol to death with an ice axe and dumped her weighted body in Coniston Water in July 1976. A jury at Manchester Crown Court dismissed his not guilty plea, after hearing how the mother-of-three, then 30, was found by divers in 1997. Park was jailed for life and told he must serve at least 15 years. The court heard if Mrs Park's body had been dumped just a few feet further from the shore it would never have been found. It had landed on an underwater ledge - a few more yards further and it would probably have sunk to the bottom. Her body was trussed up in the foetal position. There had been a meticulous use of knots, which implicated Park, who was a climber and sailor with an "unusual" interest in knots, the court heard. Trial judge Mr Justice McCombe told Park: "I am not sure there was a significant degree of planning - the evidence does not indicate one way or another. There was however considerable violence. "I also have to take into account this terrible concealment of this body that led to so much suffering to so many people for such a long time." In mitigation, Andrew Edis QC said Park had led an otherwise blameless life. The 10-week trial heard how Mrs Park had embarked on affairs and left home twice to live with her lover. Park had told the jury he loved his wife and would never have harmed her. He claimed he had taken their children on a trip to Blackpool on the day his wife vanished. He was originally arrested on suspicion of murder in 1997, but the case was later dropped due to lack of evidence. Mrs Park was dubbed the "Lady in the Lake" by detectives, after the Raymond Chandler crime novel of the same name. Speaking after the verdict, Carol Park's brother Ivor Price said: "This has been about one thing - justice for Carol. I have no feelings for Park. He is a habitual liar. "I have never doubted (the verdict), not from seven years ago. I told the police I would fight for justice and now we have got it." Det Ch Insp Keith Churchman, the senior officer in the case, said the lapse of time had caused difficulties for the investigators in terms of potential witnesses. He said: "The other difficulty was of course the body was taken away from the place where it was killed. "Carol Park was trussed up in a nightie, taken and dumped in the bottom of Coniston Water and we were left with no scene. "We had no scene of crime, we couldn't find any evidence, we couldn't look for any evidence and that is usually one of the key things we look for in a murder investigation." The Park family later said in a statement: "Mr Park and his family are devastated by the verdict. "He maintains his innocence and has the continuing support of his family and friends. "His main concerns are not for himself but for his wife and children." His legal team confirmed they were now considering whether there were grounds to appeal against the conviction.